So my question... the R300 or the R640 for this project? What's the mount that you use or recommend to mount both this light and camera on one tripod and shoot through the ring light? Today I used it as a key light with its diffuser attached during an interview where the subject was not looking directly at the light. Worked great. In that case, I wanted it full bright. But to your point, even if you dim it, your subject has to look at 640 points of light. It needs more diffusion. I purchased this light after reading this post. I was in the market for a ring light for my make up tutorials. This light is surprisingly bright. Brighter than my Fancier Tech 600cn light. It's.. super bright. The color mixes well too and I was able to get a solid white balance with the two. So thanks again, Emm. Took delivery of one of these 18" 640 LED ring lights yesterday. As I shoot through it at test subjects, the overwhelming response is, "Boy is that bright!" I had my camera down to ISO 200 and working at about f/5.6 or so. The supplied diffusion sock is not quite enough. LEDs are really annoying to look at. 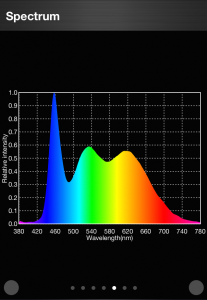 A lighting manufacturer at NAB 2013 explained to me that LEDs put out most of their energy in the UV spectrum. The way they emit visible light (at least some of them) is to excite tiny amounts of phosphors placed over the LED itself, similar to how a fluorescent lamp excites phosphors deposited on the inner surface of the tube. It also means that to be safe, manufacturers need to build in a UV filter. I sincerely believe that we instinctively realize such bright LED light is bad for our eyes and react with a squint. Then again, your poor subject also has 640 very bright point sources searing their eyeballs. The diffuser helps spread the light a bit, and it works as far as it goes, but my plan is to cut arcs of additional diffusion material and attach them to the light, over the LEDs, under the diffuser sock. The gooseneck is functional and the 5/8" socket fits a standard lightstand nicely, though I don't know how long the fine threads of the locking knob will last. With care, it'll be fine. Just don't crank the knob down or you may strip the thread out. Won't be an issue unless you are hanging the light from overhead. On a stand, gravity is your friend. What it really lacks is a way to store and transport. It arrives in a square cardboard box about 1-1/2" thick. After you attach the gooseneck, it can't fit back into the box. I don't want to unscrew the gooseneck every time to put the light away, so I'll have to locate a large, flat case of some sort. 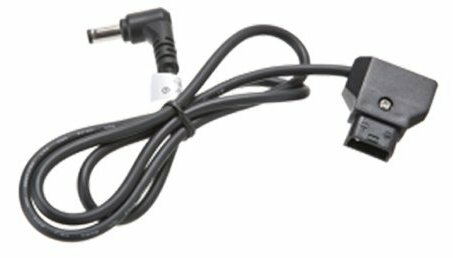 You also need to wrangle the power supply, which has a permanently attached 2.5mm x 5.5mm angled coax power plug with its approx. 2-meter cable on the output side and on the input, a two-prong removable AC cable, also about 2 meters long. The light runs on 15 volts. There's a remote control multi-pin socket, for an optional remote. On the back is an on/off rocker switch and a large dimmer knob that gives smooth control of intensity. The light is sturdy and, as I said, extremely bright. Best part: it really flatters the ladies! Every wrinkle disappears. And that circular highlight in the eyeball is really unique. After a very quick test shot this afternoon of a woman friend, my coworker looked at the results and exclaimed, "It makes her look like a model!" It's such a different look over "normal" lighting that it's sure to make certain shots really stand out. And when the ladies ask me to put the "Remove ten years" filter on, I'll actually be able to do it. 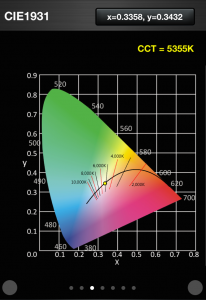 I'm guessing the R-300 won't be anywhere close to the nice image quality of this one: an actual measurement of CRI 95 is AWESOME. Have you measured CRI for the R300? @julia - As far as I know there is no such dedicated battery kit. V-mount batteries are an industry standard and this can be used with such. Otheriwse any aftermarket 14v battery can be modified to work such as the Tekkeon packs I have. Does anyone know where to find the batter pack for this light? I'm interested to try it out but would prefer to only if I can find the 14V-15V packs VS using a adapter. 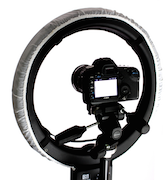 I have the R300 but it isn't the same light as an 18" ring light. They are actually different tools. Of course the R300 is brighter. A flashlight will be brighter with all of the LED bulbs massed together than spreading them out 18". If I was smart enough to read/watch carefully each thorough review you've already done on both items, I would've answered my own question! 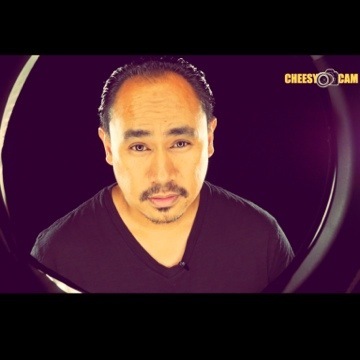 My apologize - no need to answer, appreciate the awesome reviews..keep em' coming! I think I might cop this one! Any recommendations on the 14 DC battery pack mentioned? Approx. how long can you run the light on that power pack? 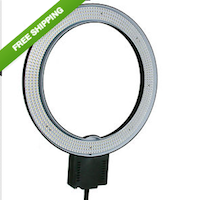 Emm, would you recommend this light vs the 18" Diva Ring light you posted before? Any key differences you think I should be aware of? Thanks! 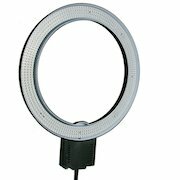 I've owned the older CFL version of this ring light and the R300. The quality of this light is not great. Everything seems fragile so may not hold up to pro use for long whereas the R300 seems a lot more durable. This light also has a gooseneck arm that's screwed into plastic with two small screws. I've never trusted it. The light quality was pretty decent. @OldCorpse - Yes it's not to replace a standard 1x1 (or R300), but it's design will appeal to that niche audience, especially portrait fashion photographers. For those who still don't understand the form factor and it's use, this link to Flickr may be inspirational: https://www.flickr.com/search?sort=relevance&text=ring%20light%20portrait. Thanks, Emm. I actually have an 18" CFL Diva Light, but for the way I use it, the catchlight is not my goal. That said, I guess if you care about the catchlight, you have to ask yourself if you need a catchlight for travel specifically, as that seems to be the advantage of this LED ring light over a CFL right light, otherwise, I get everything from my CFL ring light in studio (without travel) and the R-300 (which can travel, but no catchlight) both. It seems a pretty niche product, but I guess that depends on how one uses it. @OldCorpse - You have all great points about the R300 which is an excellent light. I specifically noted to those familiar with working with the 18" CFL because of it's ability to produce an effective catch light. 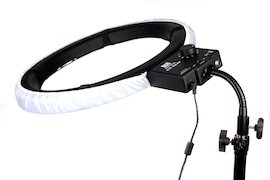 The larger the source light, the more effective the ring light effect will be. This is a desired effect that can't be duplicated by the R300. What am I missing here? Why do I want to buy this? I'm comparing it against F&V R-300. The ePhoto is $250, and the F&V is $200 for just the light with a couple filters, or a full package for $300 which is $50 more, but includes not just the softbox and eggcrate, but additional filters. Price-wise it's a wash, but the R-300 is brighter at 3'/1m at 1950 lux vs the ePhoto at 1671 lux. 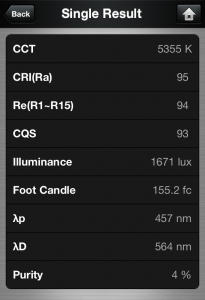 Perhaps the CRI - ePhoto is 95 and R-300 around 85. But I'd like to point out that the power solution on the R-300 is superior, IMHO, because you can use standard Sony batteries that most people have scads of hanging around instead of a special "battery pack" required by the ePhoto. Bottom line, I don't see the ePhoto as offering anything above the R-300, unless you need a larger size ring, or think that the 10 CRI difference is worth the much less brightness of the ePhoto.